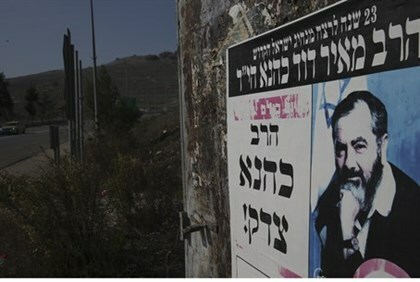 Police in the Binyamin region of Samaria arrested three nationalist activists on Friday; their "crime" - posting fliers on hitchhiking stations for the annual memorial event of former MK Rabbi Meir Kahane hy"d that is to be held next Tuesday. The three also were posting fliers for an event encouraging Jews to visit the Temple Mount, the holiest site in Judaism; Prime Minister Binyamin Netanyahu on Thursday promised Jordanian King Abdullah II he would maintain the discriminatory status quo on the site whereby Jews are forbidden from praying. Police took the three activists in for questioning on suspicion of "vandalizing property," and at the end of investigations they were released on guarantee. One of the organizers of Rabbi Kahane's memorial called the arrest a "political detention," and said the Judea and Samaria district police "have to internalize that they must deal with securing the residents and not oppressing them." This year marks 24 years since Rabbi Kahane was murdered in New York by an Arab terrorist. Former MK Dr. Michael Ben-Ari, Attorney Itamar Ben-Gvir, Lehava anti-assimilation director Bentzi Gopshtain, activist Baruch Marzel and other followers of the rabbi will lead the event in his memory as they do each year. The memorial will be held at the Heichal David hall on 14 Aholiav Street near Jerusalem Central Station next Tuesday at 6 p.m. Ahead of the event at 4 p.m. there will be a gathering at Rabbi Kahane's grave at Har Hamenuchot cemetery in Jerusalem. Ben-Ari's Otzma Yehudit movement, associated with his Otzma Leyisrael party that just fell short in the last elections, this week began a national referendum to ask the Israeli public who was right: former Prime Minister Yitzhak Rabin or Rabbi Kahane. On the one hand, Rabbi Kahane pushed for the Arab residents of Israel to be transferred to Arab lands so as to end the constant state of war from within, while on the other, Rabin passed the 1993 Oslo Accords that gave the Palestine Liberation Organization (PLO) international legitimacy, a level of independent control in Judea and Samaria and weapons. In the referendum, quotes from both leaders were presented. Rabin was quoted saying "they've promised us Katyusha (rockets - ed.) from Gaza. It's already a year that the Gaza Strip is under the control of the Palestinian Authority (PA), there hasn't been another Katyusha and there won't be a Katyusha." Rabbi Kahane for his part was quoted saying "we will be witnesses to an escalation of terror, to strengthened wars of attrition, and to extortion and concessions by the governments of Israel that are gripped by fear. We will be subjected to the horror of the threat of rockets aimed at the hearts of our cities, to the loss of our irreplaceable loved ones, and to the pressure of our 'ally' (US - ed.)."